Today I return to work. I'll be teaching high school and I'm so excited! But that's not why I'm up at 4 o'clock in the morning. 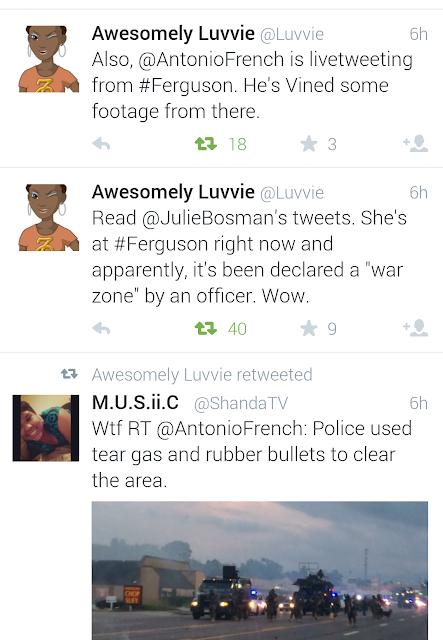 I was making a quick restroom run but I also wanted to catch up on the happenings in Ferguson, MO. If you don't know an unarmed young black man was shot 10 times by police and killed. And now it looks like a war zone on U.S. soil! I was so done with the unjust justice system. The one I wanted to be such an impactful part of that I earned a criminology degree at FSU for. I WANT A REFUND. The same one that will kill an African American in cold blood and be declared in the right. I don't know what the answer is. Truth be told, I don't even know how I can help. Earlier this year the sorority presented a Stand Your Ground Workshop for young men. The PBC Urban League also addressed this issue. I've had my son's Father talk to him. I've sought advice from other men. I've prayed. I've held my son and cried. This morning I'm fighting off the screaming voices that reminds me how invaluable we are. Nothing much has changed since the cotton fields? I don't want to believe this. All of these kids gunned down could be my son! My brothers (I have two). The young males I teach. The men connected to me who are perfectly imperfect. This knowledge is a weight that will NOT make me shed tears that won't bring resolution. Instead, I'm empowered to use my classroom as a platform to build up the young men who should know they are vital to the world. We need our black men. We need them strong and safe. This is true of our women and children too. Life matters. Black life matters. Today, I'll lift my heavy load and carry it as my assignment to TEACH not only what's in the textbook but from my heart and soul.